n alleged victim of clergy sexual abuse acknowledged yesterday that he misidentified a Wayland priest as his abuser, an error that resulted in Rev. Ronald L. Bourgault being placed on administrative leave in June. The turn of events apparently marks the first time an alleged victim has admitted to a mistaken identification in a complaint involving an Archdiocese of Boston priest. Bourgault, 64, was reinstated last weekend as pastor of St. Zepherin parish in Wayland after church officials said the allegation against him could not be substantiated. At a news conference at the parish this afternoon, Bourgault is expected to read aloud a letter from the alleged victim's lawyer acknowledging the mistake. ''My client now believes it was not Bourgault who molested him,'' said Neila J. Straub, a Salem attorney who represents the alleged victim and who has given Bourgault permission to make the letter public. Bourgault could not be reached for comment last night. The archdiocese has released no details of the allegation or its investigation, but Straub said her client, now middle-aged, has said he was abused as an altar boy at St. John the Evangelist parish in Beverly between 1965 and 1967. The victim has been unable to remember the name of his abuser, but recalls that he was handsome and had wavy hair. 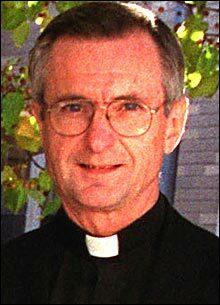 After being shown photos of several priests who served at St. John's in the 1960s, he pointed to Bourgault as his molester. The man also knew his abuser as a priest who had succeeded another parish priest who died. The Rev. George J. Butera, the current pastor at St. John's, had described Bourgault that way - and that bolstered the victim's identification, Straub said. But Butera was mistaken, as was readily established from church directories that indicate Bourgault and the now-deceased priest served together at St. John's. Butera could not be reached for comment last night. ''I find it very difficult to believe that during the course of the investigation this did not come up,'' said Straub, who criticized the archdiocese for not moving more aggressively to investigate the claim. Straub said she has asked church officials to reopen an investigation to help identify her client's abuser. Straub said her client has ''reached out'' to Bourgault. ''There's no one more than him who wants this to be made right,'' she said. The Rev. Christopher J. Coyne, a spokesman for the archdiocese, said last night he had not yet been notified that the victim has acknowledged misidentifying Bourgault. This story ran on page B3 of the Boston Globe on 2/27/2003.